🙂 In just two weeks, I’ll be packing my bags in preparation for my next trip to Walt Disney World. 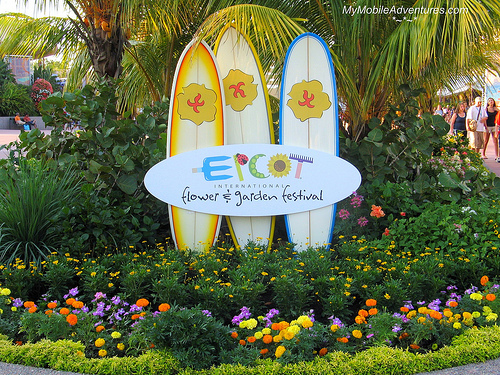 I plan to spend a lot of time at EPCOT, taking in the Flower and Garden Festival. Here’s some signage from last year’s Festival. The theme was “Fun In The Sun”. That phrase reminds me of a couple of Beach Boys tunes, most notably “Fun, Fun, Fun” and “The Warmth Of The Sun”. In fact, up front at the gates, with Spaceship Earth as a background, there was a giant topiary of Goofy surfing on a topiary “wave”, with Beach Boys music playing in the background. Here, I found the video I posted last year – check it out! Ohh This would be exciting!!!!! Enjoy your trip!!!!! and have heaps of FUN!!!! We’ve never been but…..someday ! I do believe you work for them. If not, you should be getting paid. Thanks for sharing. Happy Blue Monday. All those little flowers are wonderful!! Have fun on your next trip and I’m sure you’ll find lots more fabulous blue! Great trifecta again this week! I am hosting 13 giveaways this week. I hope you’ll stop by. Looks like a lot of fun! Happy Blue Monday! That looks like a lot of fun. Have a good time. How fun! I’ve been to Disneyland many many times, but have never been to Disney World. Enjoy yourself! Sounds like FUN to me! Very colorful photo and wonderful multi-tasking. A fun video. I have been to Disney more than I can remember for free. Lucky me. My son-in-law is an employee there. a fun post. Yes…then we’ll get live post from WDW!! I’m excited for you!